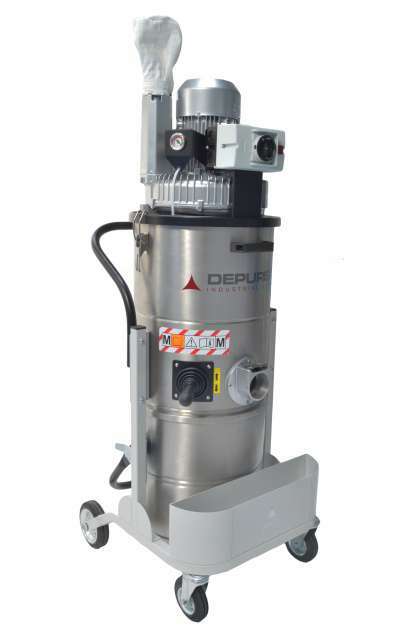 The TB Z22 model is a three-phase industrial vacuum for solid materials. It is among the most compact in its class, powerful and reliable. In addition to standard DEPURECO quality and safety features, TB Z22 is equipped with circuit breaker Siemens IP65 with electric phase control sequence, additional silencer, high-efficiency Siemens turbine with safety relief valve, AISI 304 Stainless Steel filter chamber and dust container, anti-static filter Class “M” and post-filtration on exhaust air. Absolute filter, offered on demand, is certified by the German certification body IFA; class H14 (99,995%), for vacuuming of fine or toxic dust. The industrial vacuum is certified as suitable to be used in potentially explosive atmosphere according to the European Directive ATEX 2014/34/UE ATEX II3D.